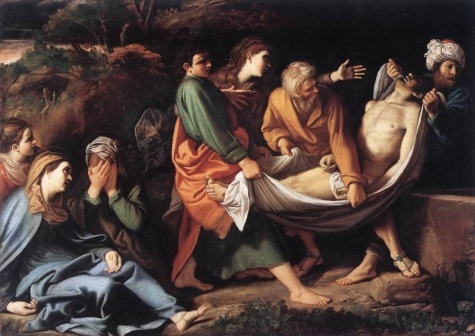 Sisto Badalocchio, The Entombment of Christ, c. 1610. Look at the emotion and movement in this painting. There was something theatric and poetic about this ritual. I loved the names: alliterative like Simon of Cyrene and Mary Magdalene; rhythmic like Joseph of Arimathea. Today, the Saturday between Good Friday and Easter Sunday, is typically referred to as Holy Saturday. This was the day that the high priests in Jerusalem went to Pontius Pilate and asked for a guard to be placed outside of Jesus’ tomb. Jesus had said he would rise in three days; the priests wanted to make sure no one came and stole the body to fake a resurrection. While at church on Good Friday, I was reminded of what a detailed account we have of Jesus’ burial–probably the most famous burial story out there. Now that my book is out, I’m hearing from readers, and thinking more again of my family members who have died (Dad, Grandpa, Grandma), and remembering how devout they were and how important the Lenten and Easter season was to them, it was as if I heard the story of Joseph of Arimathea with new ears. People who know me know of my fascination with Renaissance-era art. It’s no wonder that this scene, referred to as the Lamentation, is the subject of numerous paintings. The emotion–the sadness, grief, despair, hopelessness–makes for rich, rich art. Not only in paintings, but also in music, theater, dance, and writing.